Can UK Labour Party overcome its divisions? London – “The spectre of Iraq, Afghanistan and Libya looms over this debate. To oppose another reckless and half-backed intervention isn’t paci­fism. it’s hard-headed common sense,” Labour leader Jeremy Cor­byn warned members of his own party, opposing the British govern­ment’s motion to expand UK air strikes against the Islamic State (ISIS) from Iraq into Syria. But 67 Labour MPs, including senior members of his shadow cabinet, rejected Corbyn’s “hard-headed common sense” and voted with the government in favour of air strikes. The motion passed com­fortably on a 397-223 vote. “Britain needs a strong Labour Party. Britain needs a Labour Par­ty that can rebuild after this de­feat so we can have a government that stands up for working people again. Now it’s time for someone else to take forward the leader­ship of this party,” Ed Miliband an­nounced in May, after one of the party’s worst electoral defeats in history. He could scarcely have im­agined that he would be succeeded by Corbyn, a 66-year-old notorious back-bench rebel. For years divided between ri­val so-called Blairite and Brown­ite camps, the Labour Party gave rise to a new term in September; the Corbynista. The self-described democratic socialist and republican comfortably secured the Labour leadership, thanks in large part to a membership system brought in by Miliband that saw some 100,000 new members sign up to vote in the party’s leadership election. It was a strange and unexpected revitalisa­tion just months after Prime Minis­ter David Cameron’s Conservative Party handed it the disastrous elec­tion defeat. “Our party has changed. We have grown enormously because of the hopes of so many ordinary people for a different Britain, a better Brit­ain, a more equal Britain, a more decent Britain,” Corbyn said in his first speech as party leader. He took pains to welcome new mem­bers to the party, as well as long-time members who were returning thanks to his focus on “old Labour” values. During that speech, Corbyn called for a “new politics”. He said: “Let us build a kinder politics, a more caring society together. Let us put our values, the people’s values, back into politics,” distanc­ing himself from the failed Labour leaders who preceded him and the Blair-Brown dynamic of the Labour leadership contenders he beat to the post. Corbyn, a career politician with a trade union background, is part of the furniture of the Labour Party. He began serving as MP for Isling­ton North in 1983 during the era of prime minister Margaret Thatcher. Four prime ministers and six La­bour leaders later, and still in the same seat, he decided to stand for the leadership post, not out of a desire to reform the party but be­cause it was his “turn” to represent the far left. Corbyn is a different kind of Labour leader, something that is reflected not only in his unassum­ing demeanour but also by his far left-wing economic policies. He successfully campaigned on an anti-austerity platform, appoint­ing controversial figure John Mc­Donnell as his shadow chancellor. Labour’s new economic policy in­cludes greater taxation of the rich, greater protection of welfare and a move to nationalise major indus­tries. Blair, who swept to power in 1997 after rebranding the party as “new Labour”, defended his particular blend of politics in a recent article for the Spectator magazine, while taking an implicit swipe at Corbyn­ism, which has been viewed as a step backward in the party’s his­tory. “Many — especially in today’s La­bour Party — felt we lost our way in government. I feel we found it. But I accept in the process we failed to convince enough people that the true progressives are always the modernisers, not because they discard principle but because they have the courage to adhere to it when confronted with reality,” the former prime minister said. “We tried to put the moral pur­pose of the Labour Party into prac­tice, the only sort of morality worth very much,” Blair said. 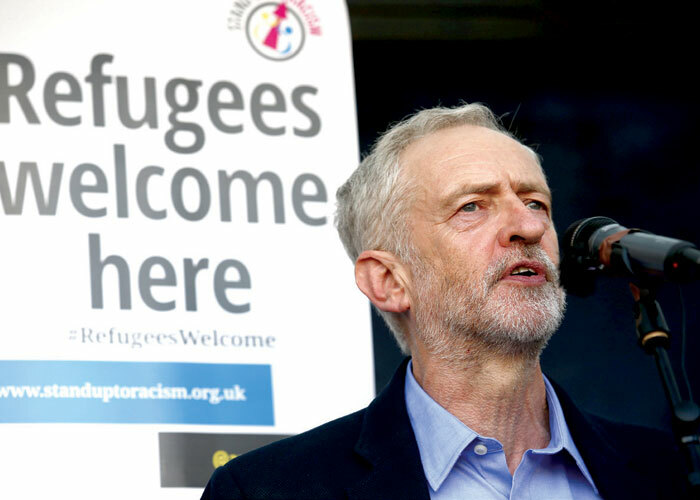 It is in foreign policy, more than anything else, that the difference between Corbyn and his predeces­sors, as well as the Labour leader and the Conservative government, is most stark. Corbyn, former chairman of the anti-war Stop the War coalition, has taken a far more isolationist role than previous leaders, say­ing he would like to scrap Britain’s Trident programme — the current generation of Britain’s nuclear sub­marines that forms the backbone of the United Kingdom’s nuclear deterrent — as well as consistently voting against British military in­tervention abroad. 2015 ended with Labour as a par­ty divided, despite the enormous party grass-root support that Cor­byn continues to enjoy as leader. Hilary Benn, the shadow foreign secretary — and son of famed La­bour politician Tony Benn — issued an impassioned speech during the Syria debate, systematically dis­mantling Corbyn’s case for a “no” vote. “As a party, we have always been defined by our internation­alism. We believe that we have a responsibility one to another. We never have — and we never should — walk by on the other side of the road,” he admonished his party during the speech. As he sat down to a resounding round of applause, many wondered what the future holds for Labour.